Graphic showing a breakdown of the calculated value of ACB's portfolio taken from Harvest Cannabis' report on Aurora. One of our very favorite parts of pot-stock twitter is the one and only Betting Bruiser. The often confrontational and ever controversial Bruiser can be found getting in to flame wars with the usual suspects and calling out canna-stock-based takes that are poorly formed, lukewarm or originate from a known or obvious shill. The Bruiser has an aggressive disinterest in your feelings, and seems like the kind of guy would run you down in an old Buick to make sure you understood how little he cared. Sure. Pump your client some more. Who’s paying you Terry Booth and company or current management? The Bruiser released a 34 page report about Aurora Cannabis this past Thursday through his research site, Harvest Moon Cannabis. The large and growing portion of weed stock twitter that he’s managed to offend immediately ridiculed this effort for reasons equally superficial and ignorant. HM Cannabis’ report on Aurora contains a multitude of grammatical errors in its mal-formed prose, and they would be easier to pick out if it didn’t read like an optical illusion. Some poor graphic design and formatting choices make it feel like trying to read an issue of Nintendo Power through a screen of chicken wire. But we aren’t interested in The Bruiser’s unique aesthetics; the guy’s conviction comes from the fact that he’s a good analyst, and he demonstrates it with a deep and relevant look at Aurora that isn’t available anywhere else. 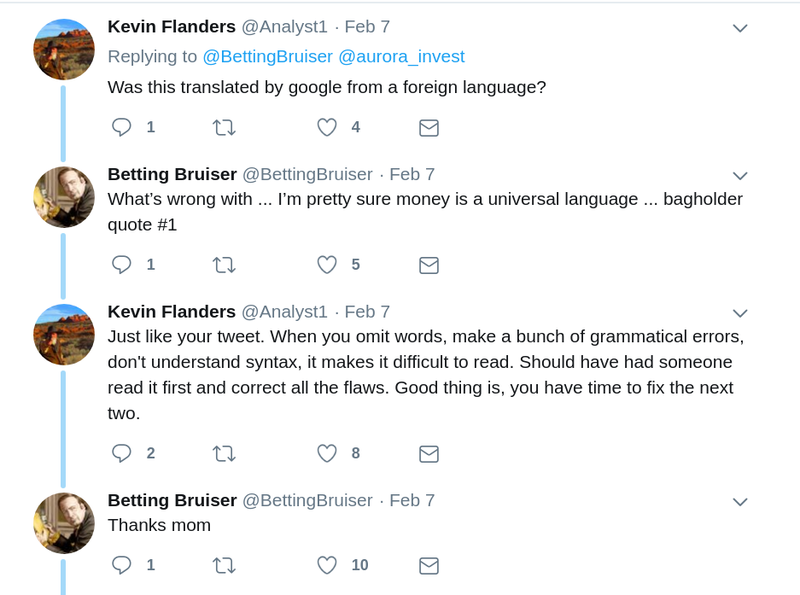 Since we don’t expect the research departments of the sell side firms that have underwritten an obscene amount of financing in ACB to spit out this kind of angle, we’ve written a summary of Betting Bruiser’s Aurora report for our readers. Much of the non-superficial push back this got on twitter had to do with a very astute point that the Bruiser made about how Aurora accounts for its non-core equity holdings. ACB chose in September to account for the liquid securities that it holds in companies that they don’t figure to be taking over by method of Fair Value through Other Comprehensive Income (FVOCI), essentially tying the on-paper market-value of the securities to Aurora’s quarterly net income. Very few companies do this in any sector, because it’s a live-by-the-market, die-by-the-market sort of move, but Aurora is just that kind of company. [Aurora] peppered off 6 million shares of their TGOD stock in October at an average price of $5.66, grossing them $35.9 million. That sale reclassified their TGOD ownership from one of significant influence to one held for investment purposes, changing the accounting designation of what was a $133.2 million investment in an associate, carried at cost, to one that can be counted as $272 million worth of marketable securities, and the cash from the sale (though now it’s only $101 million in marketable securities. Aurora’s Sep quarter was the first in which it netted out in the black, thank’s in part to $87 million in unrealized gains on marketable securities). Bruiser’s research is a deep look at how those positions are likely to be sitting at the end of December (assuming ACB didn’t lighten up over the period), and ACB comes out looking pretty beat up on the bottom line. Aurora has an earnings call scheduled for later today. As of this writing, they have not yet filed their quarterlies. We’ve summarised his take on Aurora’s holdings by their sub-sector, with a bit of commentary on outlook. Aurora peppered off some of their position in The Green Organic Dutchman Holdings (TSX:TGOD) and came out ahead in Q3. Bruiser figures they’ll have sold some more in Q4. This is one of the few positions they’re ahead on, largely because they got it cheap enough. The wheels are coming off of TGOD in a hurry, despite what a small army of bagholders would have you believe. Aurora isn’t going to hang around waiting to find out if they’re going to close the head start their peers got once they finally get around to building and licensing a facility of consequence. There’s been a slow dissolve of the “vertical integration” narrative sector-wide, as everyone tries to stay out of the fallout zone of the in-progress botching of a nationwide retail cannabis roll out. Aurora has interests in two companies that could have ended up as their retail arm if that was a limb worth having. At this stage, it may be one they choose to amputate. Both Choom Holdings (CSE:CHOO) and Alcanna (TSX:CLIQ) had their first move advantage made to look foolish when it became apparent the move was being made into an abyss. Choom is off 40% since the end of September, currently trading around $0.44 off of highs of a high of $1.18 back in June. Back then it was a pot retail play that looked damned good on paper, and may have its day yet if it can stay live and catch a bounce or two. This is the type of thing that happens to venture stage equities starting in new, uncertain landscapes. It’s a risk-on trade, and these things happen. Alcanna, on the other hand, may be the only thing less popular around Alberta dinner tables right now than that worthless, oil hating hippy elitist Justin Trudeau. CLIQ was a chain of liquor stores that put a good chunk of resources into shifting some locations into retail cannabis spaces that would probably very popular and do a lot of volume, if they could get any product. 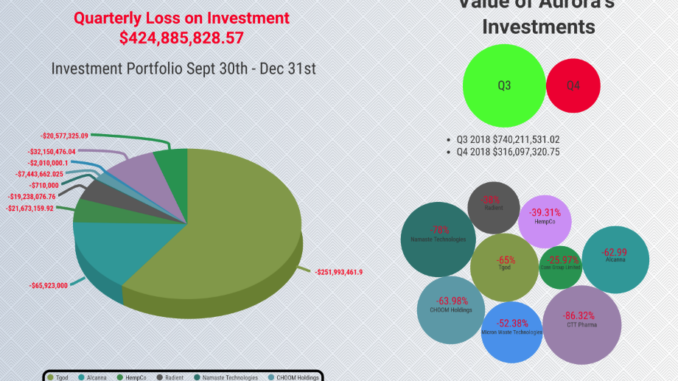 CLIQ is off 46% since the end of September, and the formerly steady yielder cut a dividend that had been paying out like a Swiss watch since 2011. Bruiser’s report calculates Aurora’s Q3 income from that dividend at $828,000. If there’s anyone who can’t reasonably use the supply shortage as an excuse, it’s Aurora. They’ve got the licenses they want, they’ve had them for months. Alcanna might have to buy their product from the provincial government, but they know where the government gets it, and they might have appreciated a heads up on the wait to have kept from having to open up a bunch of empty stores. 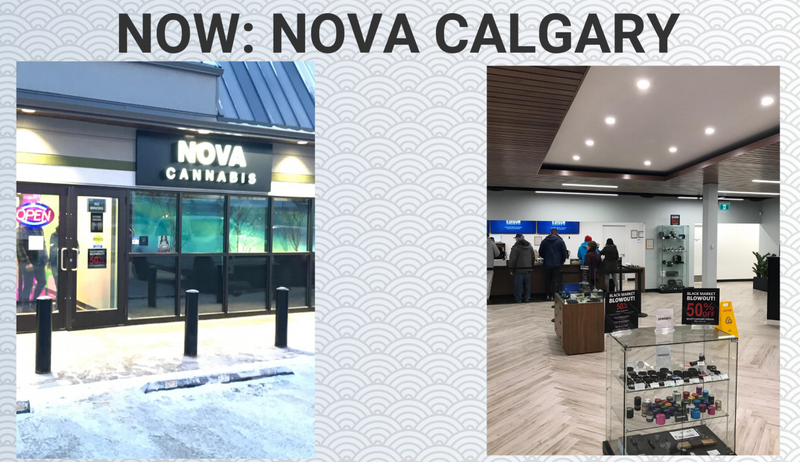 Above: CLIQ’s Nova cannabis stores on legalization day. Below, more recent pictures of retail locations starved for supply. Pictures courtesy Harvest Moon Cannabis’ DD report on Aurora. The report notes that Aurora has quietly stopped talking about their position in embattled e-retail outfit Namaste Technologies (TSX.V:N), and will probably continue to distance themselves. We recall that ACB used to mention N in the footers of all their press releases, making the aggregated press feeds in our tracker impossible to parse. The Namaste reference no longer appears in the ACB “about us” paragraph. Radient Technologies (TSX.V:RTI) is an extraction company that ACB took a position in, and it was slow to get going. They’ve got some sort of C02 / microwave based black box extraction tech that’s supposed to be better than everyone else’s. Bruiser points out valid questions about why the Health Canada license took so damned long, and also points out that RTI received their first bulk shipment of feed from Aurora, so we’ll see pretty soon how it works out. He also points out that Aurora CEO Terry Booth made a sudden departure from the RTI board this past quarter. CTT Pharma (OTC:CTTH) deals in oral delivery systems for cannabis; a thin-film wafer tech that may one day have everyone popping CBD on a breathmint. Presently, other companies are manufacturing and producing these things, and CTT has yet to file litigation against them. This sort of thing is often what happens to IP plays. Sometimes, companies with great tech end up being a room full of lawyers that runs around and tries to extract money from everybody implementing it. It’s boring, but there’s money in it. Before that works, there has to be an enforceable patent claim, and we’ve yet to see that out of CTT. 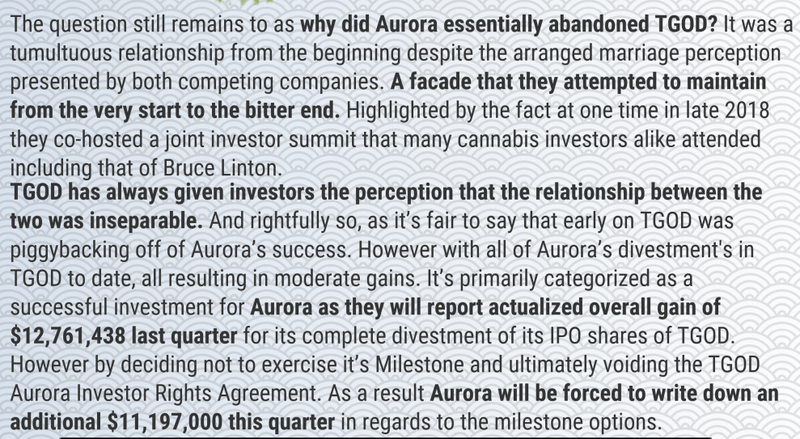 The stock lost 70% of its value over the past quarter, and Aurora would surely like to see them get in there and throw some elbows. We haven’t looked, but the key factor here is going to be their cash balance. Legal fights are only cheap when the other side gives up early for fear of being out-spent. Micron Waste Tech (CNX:MWM) is a runoff waste digesting system for cannabis. It was trialed at Aurora Mountain, and the folks at Micron say that they got some good data to optimise the system. The idea is that it’s an environmentally friendly, closed loop system that handles the runoff from Cannabis operations. Their tech is presently sub-commercial and there’s no telling yet if it’ll work. Aurora is down on this one, too. Overall, Bruiser doesn’t think much of this portfolio, and we tend to agree. By some measures, Aurora is more of a momentum-based equities fund than it is a marijuana grower, and those types of operators only SAY they’re thinking long term. ACB knows what a good story looks like and how to use an enormous pile of cash to get behind it. The company has effectively snowballed itself into an investment product that’s a proxy on the market’s appetite for the pot sector. They’re going to live and die by its popularity, provided the story stocks on the balance sheet continue to be stories people want to hear.